Cape Sounion or Sounion is a beautiful place to visit if you are looking to travel outside of Athens for a half-day trip. I believe it is one of the best places to visit outside of the main city because of the gorgeous view over the Aegean Sea. If you take a bus, you will pass by many towns and as you get closer to the Temple of Poseidon, you will see many small beaches and resorts all along the coast toward the peninsula. It is honestly a breathtaking and scenic ride on a sunny day. When you arrive, the bus drop you off in the parking lot. All you need to do is climb up some steps and you will arrive at the entrance of the Temples of Poseidon. It was windy the day I went but that should not stop you if it is sunny and warm. You are free to take as many photos as you would like. Do not be surprised if you see painters working on their canvases to capture the beautiful scene. I am sure the view is great if you stay for the sunset but you just have to time yourself correctly because it is near closing time. When you exit the historical attraction, there is a restaurant called Noah where you can have breakfast or lunch. There is also a souvenir shop right beside it. When you are ready to leave, buses will arrive the same place you are dropped off. I promise you will not regret visiting! Photography by me and my family. 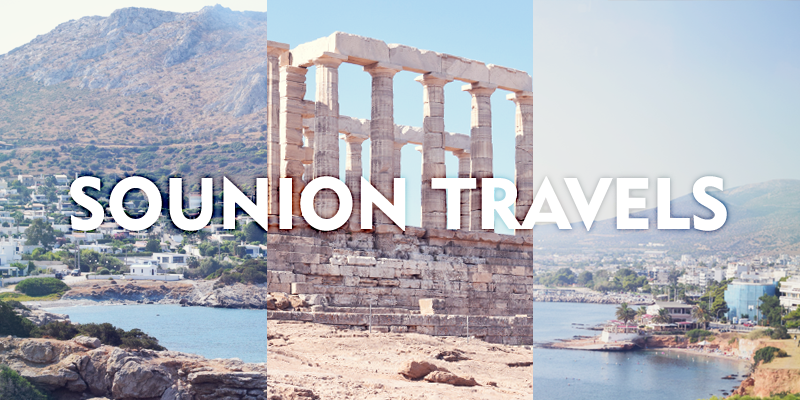 → A tourist spot located at the tip of the Attica peninsula, which is south of Athens. → Reservations can be made through Hotels.com or any online booking website. → Booked a non-smoking, one queen bed room with 2 cots. → The room includes: LCD TV with satellite channels, refrigerator, shower, hair dryer, phone, complimentary toiletries, bathrobes, no parking, smoke-free property, air conditioning, and iron/ironing board (on request). → Free wi-fi in rooms and public areas. → Free breakfast buffet was included during my stay. → The hotel is walking distance from the Acropolis Museum and restaurants. → You can read more about the hotel in my review. → Bus To Sounion: Public bus transportation is 4,90EUR each way (tour buses are more expensive > 30EUR) and is about a two hour ride one way. If you are near Syntagma Square, there is a bus stop on Filellinon Street. The bus operates from 6:30 to 17:30 and arrives every hour. From Sounion, the bus run every 30 minutes. Languages: Greek is the official language but there are many tourists so most citizens know English. Tipping: Tipping is required at hotels, restaurants, or taxis. Hopped aboard the KTEL bus to Cape Sounion. The beginning of the scenic coastline. Lagoons where people are free to swim. The Temple of Poseidon from afar. Was able to get these great shots because there weren't too many tourists. You look so lovely! amazing photos! Wow, this place is so gorgeous! I've always wanted to visit, but never have the time to. Also loving your skirt with that slit! thank you for the travel guide. love how you structured the post.